With the great tart and tangy flavor of our regular product, but half the calories. Sweetened with Splenda. 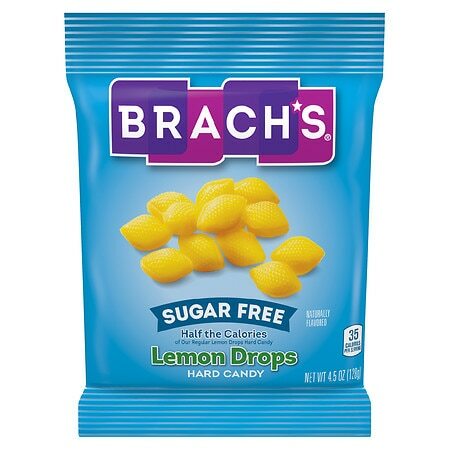 Freshness guaranteed: Brach's stands behind the quality of our products. We guarantee your satisfaction or we will replace this product. Please call 1-888-247-9855 or contact us at www.brachs.com. © 2010 Farley's & Sathers Candy Co., Inc.
ALLERGEN INFORMATION: MILK, EGG, WHEAT, PEANUTS, TREE NUTS AND SOY MAY BE PRESENT IN THE MANUFACTURING OR PACKAGING AREA. EXCESSIVE CONSUMPTION [OF ISOMALT] MAY HAVE A LAXATIVE EFFECT..